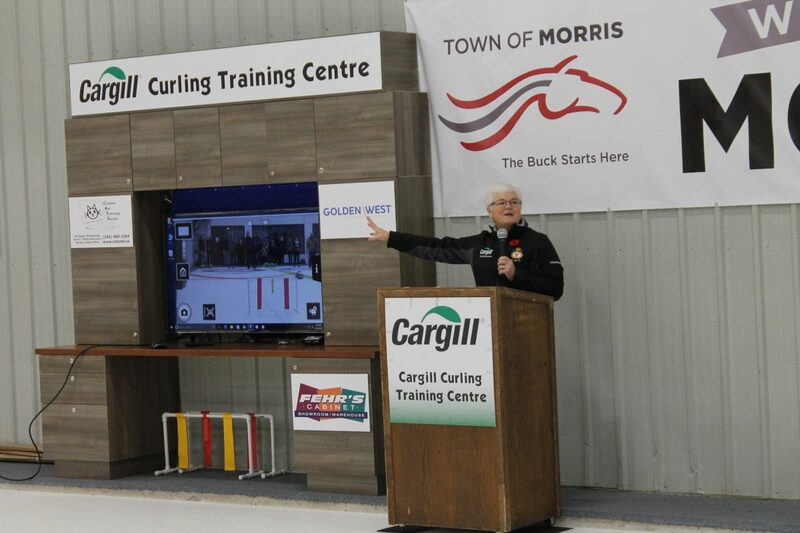 On November 2, 2016 the Morris Curling Club officially opened Phase 1 of the Cargill Curling Training Centre. Home/DEKALB SuperSpiel/On November 2, 2016 the Morris Curling Club officially opened Phase 1 of the Cargill Curling Training Centre. This is the first of its kind in Manitoba and is fashioned after Curling Canada’s National Training Centre at the Saville Centre in Edmonton Alberta. The Cargill Curling Training Centre will enhance the learning and training of curlers from the beginner to the elite curler. At the centre of the facility is a 55” TV which will pick up live video of athletes to assist in analysis and correction. The centre also includes: 2 HD video cameras, 4 Ipads, 6 speed traps, 5 lasers, tripods for Ipads and cameras and training gates; all stored in a cabinet on ice. This makes everything ready and available for easy use. The Training centre is enhanced by the access to the Wellness Centre for dryland training and club rooms for classroom training of mental, nutrition, strategy, tactics and game plan. The Centre thanks Curl Manitoba and Connie Laliberte for their assistance in putting together the equipment list based on what is available in the Saville Centre. “Cargill is happy to support this initiative that will enable more curlers to have access to training equipment and a quality curling environment to help cultivate strength in our curling community,” said Dallas Oldcorn, Sales Manager Manitoba Region, Cargill Agricultural Supply Chain North America. With the addition of this new equipment it gave the Morris Curling Club an opportunity to host the next step in high performance training for junior curlers in Manitoba. On Tuesday, Oct 11 Curl Manitoba’s NextGen program hit the ice. It is a team based program with the coaches being on ice as part of the team. The program will run for 19 weeks and will include all aspects of team based training. Lorne and Chris Hamblin, level 4 NCCP coaches are the lead instructors for the program assisted by Gerald May, a level 2 NCCP instructor. As mentioned in the opening paragraph the electronic equipment is phase 1 of the Cargill Curling Training Centre. Phase 2 is to establish a year round Curling training facility. In order to accomplish this, a geothermal heating ground loop needs to be added under the Curling rink floor to prevent damage by perma frost. A dehumidification system will also be part of this project. The goal is to have the all work done in the spring/summer of 2017 in time for the fall opening providing funding is in place. Fundraising continues for Phase 2. All Curling Clubs, schools, new and experienced curlers are invited to contact Lorne or Chris to set up an opportunity to experience curling training in a super fun environment. Manitoba’s Elite athletes now have the opportunity to train close to home with all the training devices. Curlers, You’re Invited to the 11th DEKALB SuperSpiel! Great Roster for the 2017 DEKALB SuperSpiel!